From time to time I will update an older post, not because the recipe wasn’t good, but because three years ago my photos were pretty bad, and really didn’t do justice the dish! 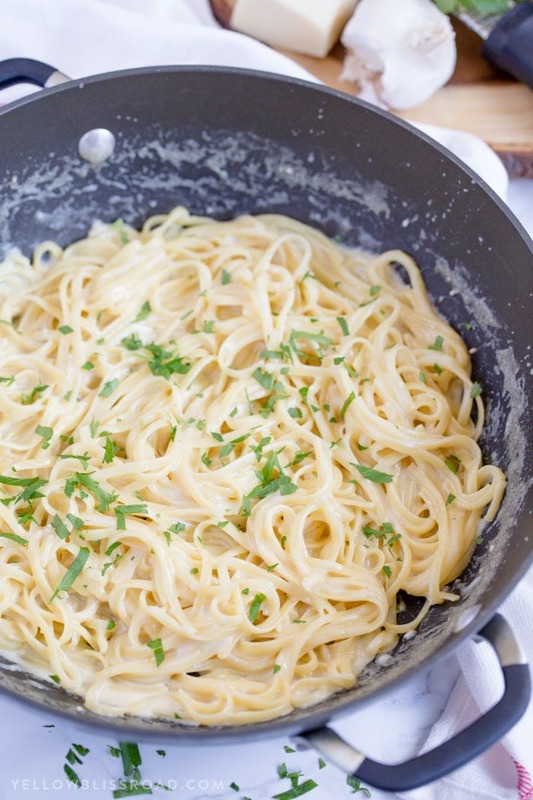 This is one of those, because this One Pan Garlic Parmesan Pasta is Ah-Mazing! 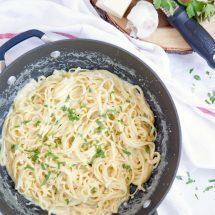 This one pot pasta dish is lightened with the use of nonfat milk with or in place of whole milk or heavy cream. For the remake, I chose to use half nonfat milk and half heavy cream. 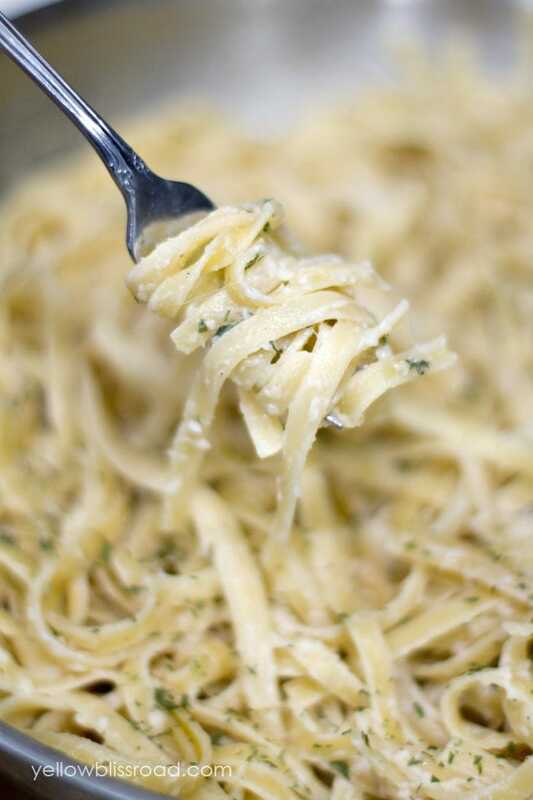 The more cream you use, the more richer your pasta dish will be. I also chose linguine instead of fettuccine, but really any long, skinny pasta could be used. You’ll just need to adjust the cooking time slightly. First heat some olive oil in a 12 inch skillet. Add the garlic and stir as it cooks. It will become quite fragrant at this point and your family will come in wondering what that amazing smell is. As the garlic is just beginning to brown, you’ll add the rest of the ingredients, except the cheese and parsley. 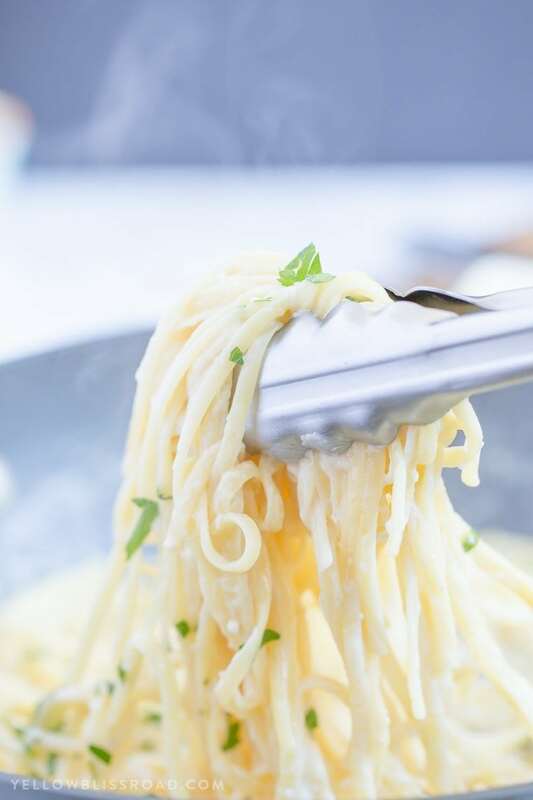 It will be getting all nice and bubbly at this point, so you’ll want to stir it up to coat the pasta and bring it to a boil over medium-high heat. 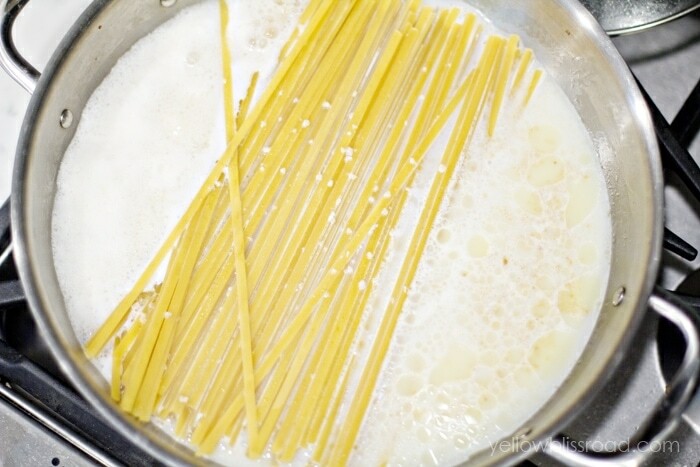 Cook the pasta for about 10 minutes or until tender. Once the pasta is cooked through (there should still be just a little liquid left in the pan), stir in the Parmesan cheese and parsley. 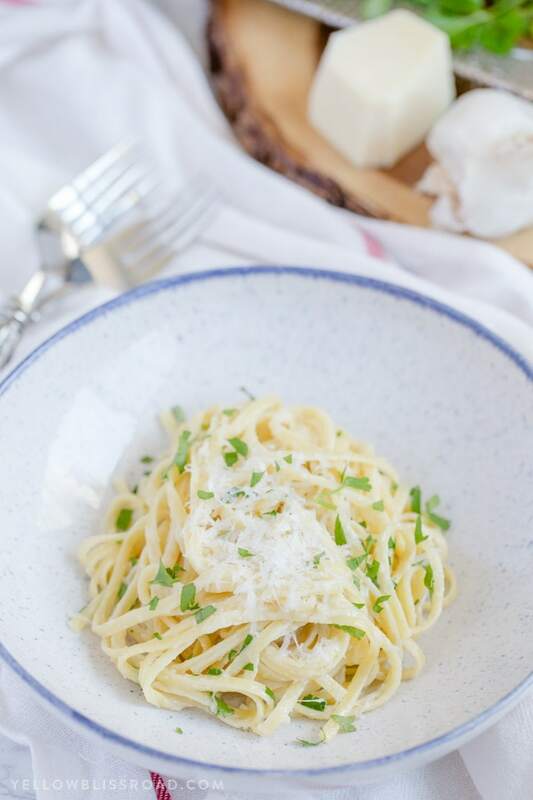 Pro Tip – Add the Parmesan in a thin layer evenly across the top of the pasta and then gently toss to melt and coat the pasta. Do this in two batches if necessary to ensure the cheese doesn’t clump as it melts. In a 12 inch skillet over medium-high, heat olive oil and add garlic. Stir and cook until garlic becomes fragrant and just starts to brown; about 1 minute. Add pasta, salt, pepper, butter, chicken stock and milk/cream. Stir and bring to a boil. 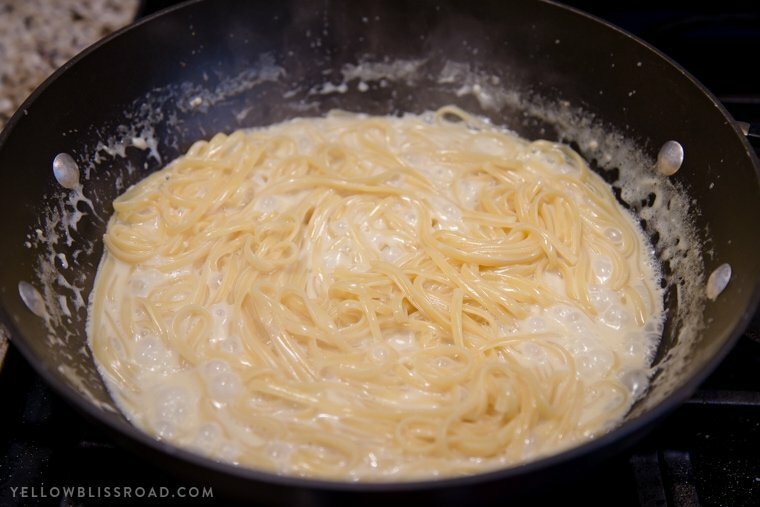 Reduce heat to medium-low, cover and simmer for 20 minutes or until pasta is tender. *OR cook and stir constantly for about 10 minutes for a quicker finish time. 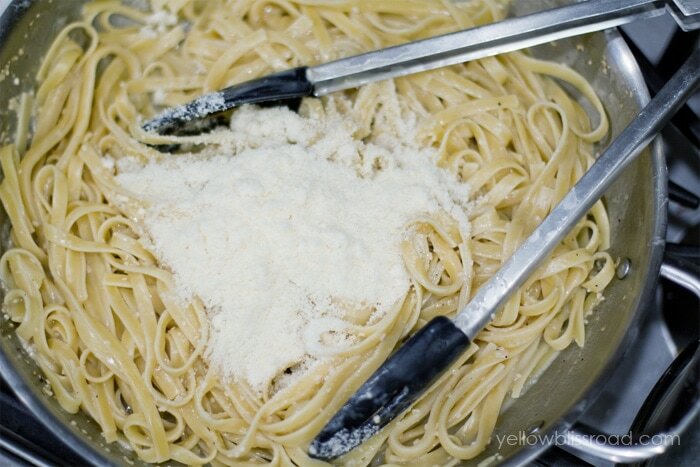 Remove from heat, toss pasta, and stir in Parmesan Cheese (sprinkle cheese in a thin, even layer for best melting). 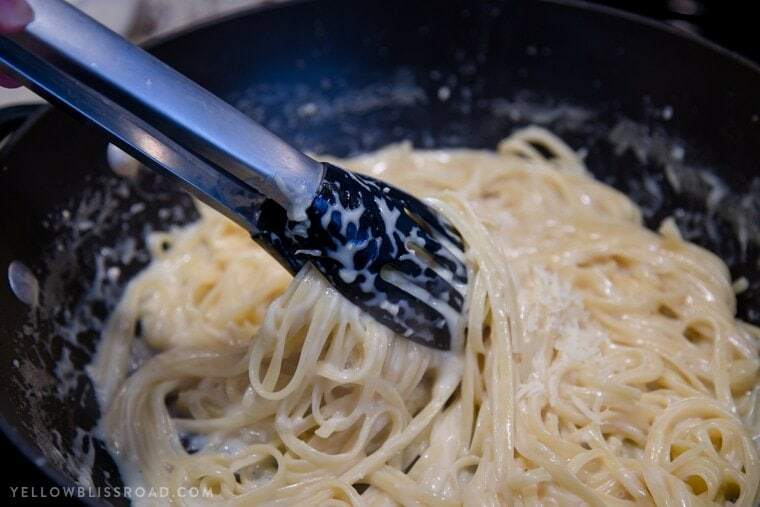 *Pro-tip - I use a microplane and grate right over the pasta. Sprinkle parsley on top. Divide into bowls and serve hot. 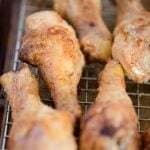 My family and I love this recipe. My girls ask for pasta at least once a week. We add chicken or broccoli or both. So delicious thank you for sharing. Delicious! I added a little extra Cream,Broth, and Parm. To make up for adding shredded chicken. It came out wonderful!!!! 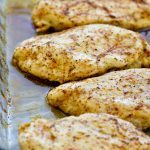 I love adding chicken to this recipe! Looks great, easy to make, I’ll try your recipe and see how it works:)). Love all the photos your posted. Thanks so much for sharing Kristen! There are lots of online calculators. I would just google the conversions. 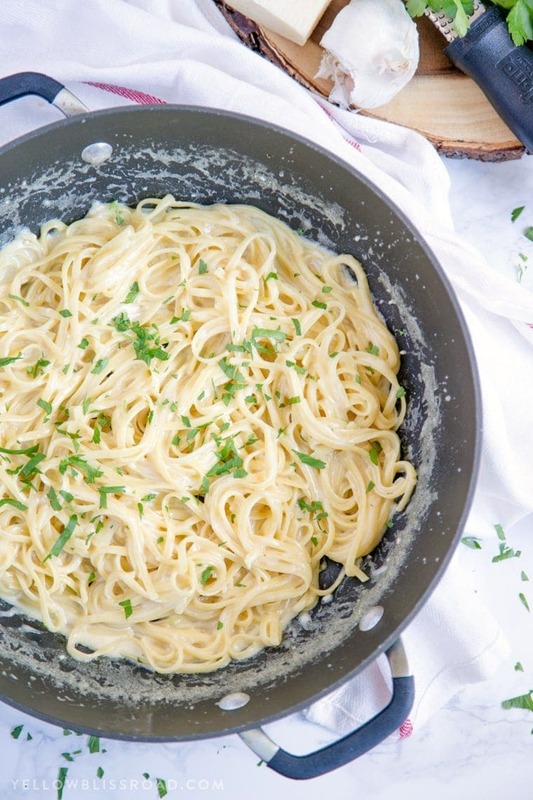 How would you do this with fresh pasta that doesn’t need ten minutes to cook? I made this tonight and it was very good! It took about 30 minutes start to finish, which is great during the week. I was feeling indulgent so I used 3/4 cup half and half and 1/4 cup 1% milk. 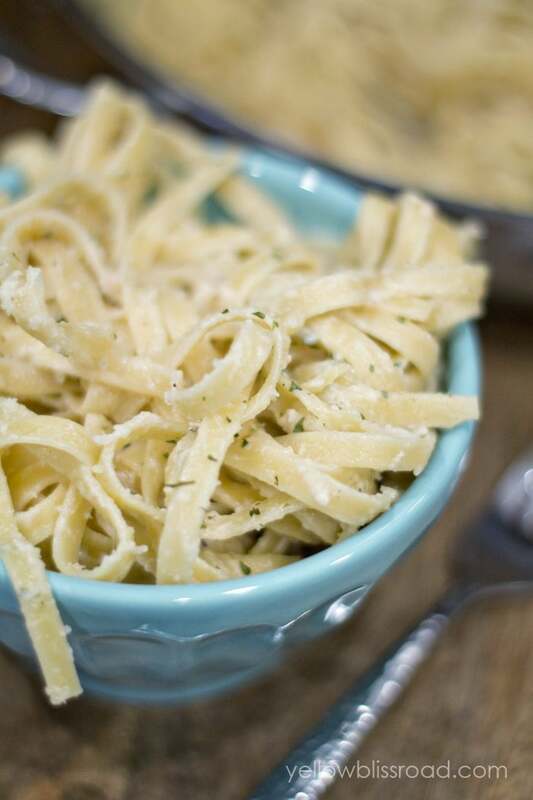 I used a little more linguine than it calls for because we like to eat (I made it for three). I added steamed broccoli with the Parmesan at the end. The only thing I’ll do differently next time is cut the salt in half because there was a little too much. Otherwise this one is a keeper! Thank you Judy! Thanks for sharing your experience! Is it one cup of heavy cream and one cup of milk or half of heavy cream and half cup of milk. You need 1 cup total – could be 1 cup all cream or 1 cup all milk, or any combination of the two. 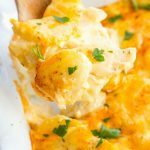 Would love to make this but what is the sodium content? OMG!!! This is a keeper, I added a small amount of steamed broccoli and the breath of a rotisserie chicken when I tossed in the Parm! If it is too think I added some whole milk and stirred until my desired consistency! Thank you, thank you! Great recipe! Hard to read. You need to proof read your blogging. It would help. Good recipe once I skipped straight to it. Good photos. I caught one typo, thanks. Made this tonight with some garlic shrimp on top! Delicious!! Great pasta recipe!!! So I’m pretty new to cooking and I was wondering if it was one cup milk and one cup of cream or half a cup milk, half a cup cream? It’s one cup total – so half a cup of each. I have made this a few times. I adjusted the sauce slightly, as I like a saucier pasta. It is very good and very simple to make. Would it be ok to double the size we have a huge family and I really want this tonight!! Made this tonight. Everyone loved it! It was so easy. Made this tonight with a twist. I used shrimp stock instead of chicken and added cooked shrimp. It was great and my picky husband loved it! I have made this twice. The first time according to the directions, and it tasted too starchy. The second time I boiled the noodles separately then added them, and it tasted much better. I made this for dinner today. It was a big hit. 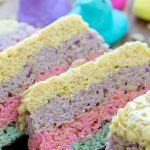 Very easy to make and super delicious. I’m making this tonight!! 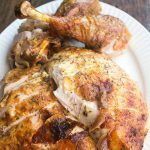 I bought a roast chicken and will chop it up and add at the end. Easy, thank you for one-pot ideas!! 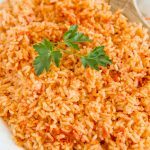 How do I adjust the servings for more? My husband loved this and that is quite a compliment. I used Half & Half instead of the 1 cup milk/cream. 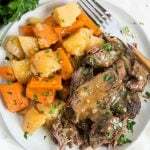 Thank you so much for this amazing recipe! This is truly a one pot recipe. 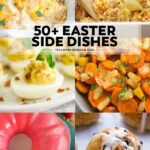 My whole family loves this dish!! It is so tasty. I have never cooked pasta that way and I absolutely loved it- cooking it in chicken broth and other ingredients is genius. Thank you! !